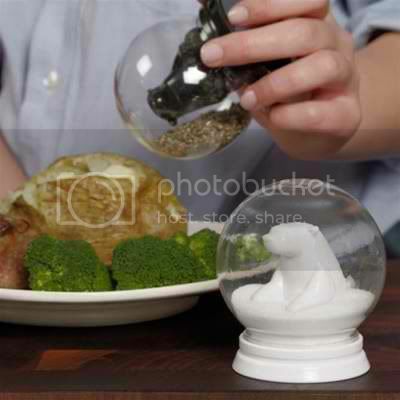 Salt and Pepper can easily get boring after a while, so I'm grabbing a pair of these Snow Globe Salt and Pepper Shakers from GamaGo the moment I have USD 12.00 lying around the house. I know it's fun and all but I really have to resist the urge to pour in water, cause you know... Then everything will taste like soup. Salty peppery soup. Either that or I grab these Grenade salt and pepper shakers instead.